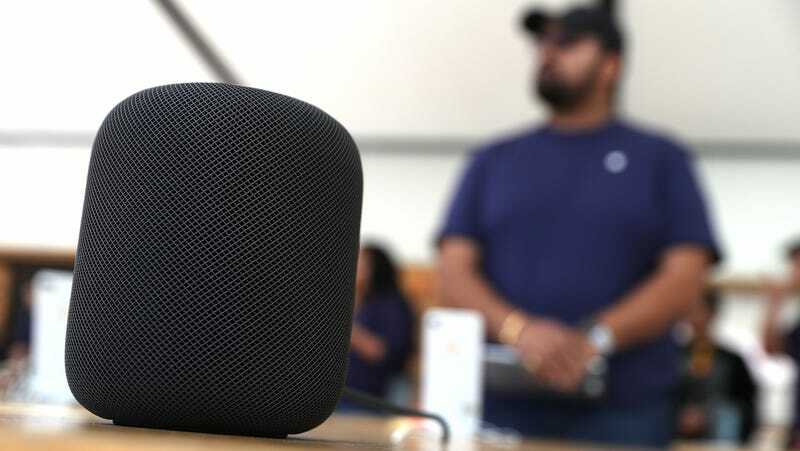 Do you own a HomePod, Apple’s needlessly expensive smart speaker? Have you ever wished you could connect your multiple HomePods, the ones that sit lovingly in your magnificent house, so they could all play the exact same song at the exact same time? Does that kind of technology sound like it should’ve already been included when the HomePod launched in February this year? Well, better late than never—Apple today announced the ability to sync music between multiple HomePods. Two HomePods can also now work as a stereo pair. The ability to sync up multiple speakers is fairly common among the HomePod’s competitors, like Amazon’s Echo, Google’s Home, or Sonos. For the few of you who actually own a HomePod, news of the added functionality may be, ahem, music to your ears, but the addition would’ve also been nice if it was included in Apple’s launch only a few months ago. That’s not the only bit of HomePod news out today. Apple also announced that on June 18, Canada, France, and Germany will be getting the HomePod. Now even more countries can buy this expensive smart device that migh not be selling so hot. Though still in its early stages, increasing the HomePod’s features and expanding its availability is what Apple needs to do for the device to start competing with all the other similar options out there.